What you see above is Solid Signal’s new Pure amplifier. It’s an extremely low noise amplifier that’s causing a lot of noise out in the real world. There’s a real controversy about amplified antennas and it doesn’t help the matter that most of the arguments use words like “should” and “might.” Antennas are supposed to be science, right? An antenna amplifier, like any amplifier, takes in a signal and puts out a much stronger signal that has the same characteristics as the old signal. If the signal was noisy to begin with, it will be noisy coming out, too. Add to that the “noise figure” of the amplifier, which in simple terms is the amount of noise that’s added in just by the amplification process. Compensate for long cable runs. If you run a long cable, you can put your antenna up higher, or close to a window, in the attic or on the roof. However, long cable runs cause signal loss. An amplifier can help with that. Use one antenna for multiple TVs. A splitter causes more signal loss than almost any other part of your antenna system. Adding an amplifier will help the signal stay strong as it travels through the house. Bring in fringe signals more reliably. This one is a little controversial. Remember that you’re not just amplifying the signal but the background noise. A distant signal might have so much noise that it’s not worth amplifying. However, there is a case where an amplifier should help. Digital TV tuners “lock on” to a signal before they start processing. If they don’t have the ability to lock on, they won’t even try to process the signal. There are cases when amplifying the signal can strengthen it just enough that the TV is able to lock on all the time. Foes of antenna amplifiers point out (and rightly so) that it’s often better to use a larger antenna to pull in a stronger signal rather than trying to amplify a weaker one. 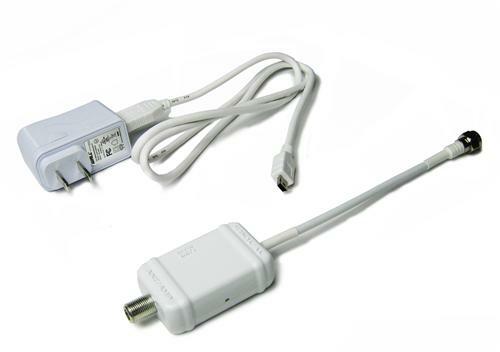 It can be less expensive to put a larger antenna up as well, as amplifiers aren’t cheap. On the other hand, you may not have the option of a larger antenna, if you live in an apartment or simply can’t get up on the roof yourself. At Solid Signal, we’re here to give you the best advice we can so you can pick the antenna that’s best for you. We have a good selection of larger antennas as well as antenna amplifiers so that no matter what you choose you’ll find what you need. NICE AND EASY: Should you worry about TV broadcasts rotting your brain?